The Klamath National Forest announced April 18, that they have canceled the Whittler Timber Sale! 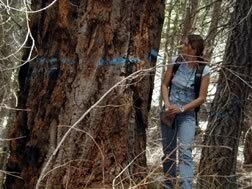 Located between the Trinity Alps and Russian Wildernesses in northern California, the Whittler timber sale would have logged old growth in critical habitat for the northern spotted owl and cut into a roadless area adjacent to the Wilderness Areas. The Klamath National Forest had planned to log around the high mountain lakes on Craggy Peak, which is in the East Trinity roadless area and around Jackson Lake. The headwaters of the Scott River flow from this area down into the Klamath River. The Scott is a stronghold for Coho salmon, but the river is highly impacted by farming in the Scott Valley and extensive logging. KS Wild submitted an appeal, and was preparing litigation, demonstrating that the timber sale would have negatively impacted old-growth habitat and water quality due to tractor logging on rocky soils at high elevations, as well as causing fragmentation between areas of ecological significance, namely the Russian, Trinity Alps and Marble Mountain Wilderness Areas. We welcome the decision of the Klamath National Forest to step back from this destructive old-growth timber sale.